Julienne and company are back with this awesome cozy mystery set in Colorado Springs. Spiked by Avery Daniels finds event planner Julienne LaMere with a last minute wedding to coordinate at the Colorado Springs Resort. The bride-to-be has a charming brother who is easy on the eyes, but Julienne is still upset over her breakup with Mason and isn't sure she is ready to open up her heart to Liam. 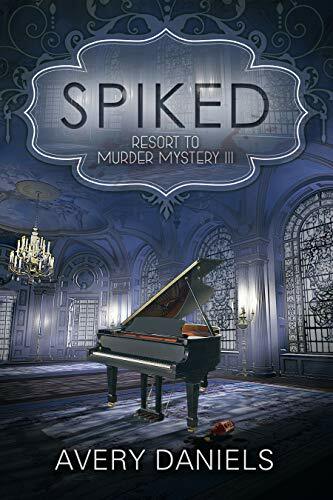 When a private investigator looking for someone at the resort winds up dead with Julienne's business card on his person, she finds Detective Lawrence knocking on her door again. Her boss Chad puts her in charge of a quiet investigation to uncover clues to keep the resort and any tie to the murdered PI out of the papers. Little does he know, he's just put her in a killer's sights. The first book of the Resort to Murder series was so much fun, when I heard Daniels was touring with this new book, I had to make time for it. A mixture of danger, humor, and romance set in lovely Colorado Springs, the author writes a perfect cozy mystery with enough twists and turns to keep you guessing. With a new potential love interest, an unusual wedding to plan, Chad's unreasonable demands, and a cast of helpful family and friends, Julienne just might get this one solved. Though a total stand-alone novel, I suggest you start with the first book. You'll certainly want to read the next two right away if you do.